Thy soul was inflamed by the zeal of God's House, O Peter! God gave thee to his Church in those sad times when the wickedness of the world had robbed her of well nigh all her beauty. Thou hadst the spirit of an Elias within thee, and it gave thee courage to waken the servants of the Lord: they had slept, and while they were asleep, the enemy came, and the field was oversown with tares. Then did better days dawn for the Spouse of Christ. Grant, we beseech thee, O almighty God, that we may follow the admonitions and example of blessed Peter, thy Confessor and Bishop; that by despising earthly things we may obtain eternal joys. Through our Lord Jesus Christ, thy Son, who liveth and reigneth with thee, in the unity of the Holy Ghost, God, world without end. Amen. It is the Feast of the austere reformer of the 11th century, Peter Damian, the precursor of the holy Pontiff Gregory the Seventh, that we are called upon to celebrate to-day. To him is due a share of that glorious regeneration, which was effected at that troubled period when judgment had to begin at the House of God (St. Peter, iv. 17). The life he had led under the Monastic Rule had fitted him for the great contest. So zealously did he withstand the disorders and abuses of his times, that we may attribute to him, at least in great measure, the ardent faith of the two centuries which followed the scandals of the 10th. The Church ranks him among her Doctors, on account of his admirable Writings; and his penitential life ought to excite us to be fervent in the work we have in hand,—the work of our Conversion. The following Lessons, read by the Church, on this Feast, give us a sketch of our Saint's Life. Peter was born at Ravenna, of respectable parents. His mother, wearied with, the care of a large family, abandoned him when a babe; but one of her female servants found him in an almost dying state, and took care of him, until such time as the mother, repenting of her unnatural conduct, consented to treat him as her child. After the death of his parents, one of his brothers, a most harsh man, took him as a servant, or more truly as his slave. It was about this period of his life that he performed an action, which evinced his virtue and his filial piety. He happened to find a large sum of money; but instead of using it for his own wants, he gave it to a priest, begging him to offer up the Holy Sacrifice for the repose of his father's soul. Another of his brothers, called Damian (after whom, it is said, he was named), had him educated; and so rapid and so great was the progress he made in his studies, that he was the admiration of his masters. He became such a proficient in the liberal sciences, that he was made to teach them in the public schools, which he did with great success. During all this time, it was his study to bring his body into subjection to the spirit; and to this end, he wore a hair-shirt under an outwardly comfortable dress, and practised frequent fasting, watching, and prayer. Being in the very ardour of youth, and being cruelly buffeted by the sting of the flesh, he, during the night, would go and plunge himself into a frozen pool of water, that he might quench the impure flame which tormented him; or, he would make pilgrimages to holy sanctuaries, and recite the entire Psaltery. His charities to the poor were unceasing, and when he provided them with a meal, which was frequently, he would wait upon them himself. Out of a desire to lead a still more perfect life, he became a religious in the Monastery of Avellino, in the diocese of Gubbio, of the Order of the Monks of Holy Cross of Fontavellana, which was founded by the blessed Ludolphus, a disciple of St. Romuald. Being sent by his Abbot, not very long after, first to the Monastery of Pomposia, and then to that of Saint Vincent of Pietra-Pertusa, he edified both Houses by his preaching, admirable teaching, and holy life. At the death of the Abbot of Avellino, he was recalled to that Monastery, and was made its superior. The institute was so benefited by his government, not only by the new Monasteries which he founded in several places, but also by the very saintly regulations he drew up, that he was justly looked upon as the second Founder of the Order, and its brightest ornament. Houses of other Orders, Canons, yea entire congregations of the Faithful, were benefited by Peter's enlightened zeal. He was a benefactor, in more ways than one, to the diocese of Urbino: he aided the Bishop Theuzo in a most important suit, and assisted him, both by advice and work, in the right administration of his diocese. His spirit of holy contemplation, his corporal austerities, and the saintly tenor of his whole conduct, gained for him so high a reputation, that Pope Stephen the Ninth, in spite of Peter's extreme reluctance, created him Cardinal of the holy Roman Church and Bishop of Ostia. The saint proved himself worthy of these honours by the exercise of the most eminent virtues, and by the faithful discharge of his Episcopal office. It would be impossible to describe the services he rendered to the Church and the Sovereign Pontiffs, during those most trying times, by his learning, his prudence as Legate, and his untiring zeal. His life was one continued struggle against simony, and the heresy of the Nicolaites. He purged the Church of Milan of these disorders, and brought her into subjection to the Holy See. He courageously resisted the anti-popes Benedict and Cadolaus. He deterred Henry 4th, king of Germany, from an unjust divorce of his wife. He restored the people of Ravenna to their allegiance to the Roman Pontiff, and absolved them from interdict. He reformed the abuses which had crept in among the Canons of Velletri. There was scarcely a single Cathedral Church in the Province of Urbino that had not experienced the beneficial effects of Peter's holy zeal: thus, that of Gubbio, which was for some time under his care, was relieved by him of many evils; and other Churches, that needed his help, found him as earnest for their welfare as though he were their own Bishop. When he obtained permission to resign his dignity as Cardinal and his Bishopric, he relented nothing of his former charity, but was equally ready in doing good to all. He was instrumental in propagating many devout practices; among these may be mentioned, fasting on Fridays in honour of the Holy Cross; the reciting the Little Office of our Lady; the keeping the Saturday as a day especially devoted to Mary; the taking the discipline in expiation of past sins. At length, after a life which had edified the world by holiness, learning, miracles, and glorious works,—on his return from Ravenna, whither he had been sent as Legate, he slept in Christ, on the eighth of the Calends of March (February 23rd), at Faënza. His relics, which are kept in the Cistercian Church of that town, are devoutly honoured by the Faithful, and many miracles are wrought at the holy shrine. The inhabitants of Faënza have chosen him as the Patron of their City, having several times experienced his protection when threatened by danger. His Mass and Office, which were kept under the rite of Confessor and Bishop, had been long observed in several Dioceses, and by the Camaldolese Order; but they were extended to the whole Church by a decree of the Congregation of Sacred Rites, which was approved by Pope Leo the Twelfth, who also added to the name of the Saint that of Doctor. Peter, surnamed of Damian, was born about the year 988, in Ravenna, of a good family, but reduced. He was the youngest of many children, and, losing his father and mother very young, was left in the hands of a brother who was married, in whose house he was treated more like a slave, or rather like a beast, than one so nearly related; and when grown up, he was sent to keep swine. He one day became master of a piece of money, which, instead of laying it out in something for his own use, he chose to bestow in alms on a priest, desiring him to offer up his prayers for his father's soul. He had another brother called Damian, who was archpriest of Ravenna, and afterwards a monk; who, taking pity on him, had the charity to give him an education. Having found a father in this brother, he seems from him to have taken the surname of Damian, though he often styles himself the Sinner, out of humility. Those who call him De Honestis, confound him with Peter of Ravenna, who was of the family of Honesti. Damian sent Peter to school, first at Faenza, afterwards at Parma, where he had Ivo for his master. By the means of good natural parts and close application, it was not long before he found himself in a capacity to teach others, which he did with great applause, and no less advantage by the profits which accrued to him from his professorship. To arm himself against the allurements of pleasure and the artifices of the devil, he began to wear a rough hair shirt under his clothes, and to inure himself to fasting, watching, and prayer. In the night, if any temptation of concupiscence arose, he got out of bed and plunged himself into the cold river. After this he visited churches, reciting the psalter while he performed this devotion, till the church office began. He not only gave much away in alms, but was seldom without some poor person at his table, and took a pleasure in serving such, or rather Jesus Christ in their persons, with his own hands. But thinking all this to be removing himself from the deadly poison of sin but by halves, he resolved entirely to leave the world and embrace a monastic life, and at a distance from his own country, for the sake of meeting with the fewer obstacles to his design. 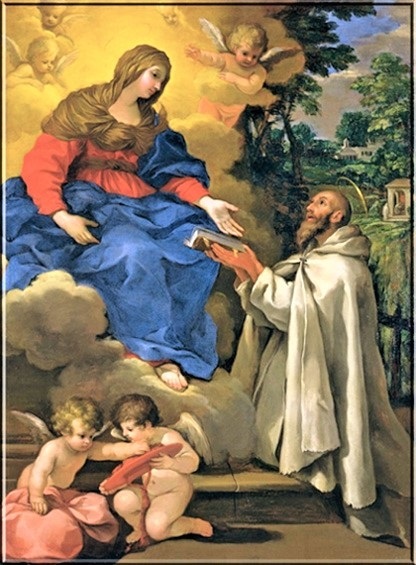 While his mind was full of these thoughts, two religious of the order of St. Benedict, belonging to Font-Avellano, a desert at the foot of the Apennine in Umbria, happened to call at the place of his abode; and being much edified at their disinterestedness, he took a resolution to embrace their institute, as he did soon after. This hermitage had been founded by blessed Ludolf, about twenty years before St. Peter came thither, and was then in the greatest repute. The hermits here remained two and two together in separate cells, occupied chiefly in prayer and reading. They lived on bread and water four days in the week: on Tuesdays and Thursdays they ate pulse and herbs, which every one dressed in his own cell: on their fast days all their bread was given them by weight. They never used any wine, (the common drink of the country,) except for mass, or in sickness: they went barefoot, used disciplines, made many genuflections, struck their breasts, stood with their arms stretched out in prayer, each according to his strength and devotion. After the night office they said the whole psalter before day. Peter watched long before the signal for matins, and after, with the rest. These excessive watchings brought on him an insomnie, or wakefulness, which was cured with very great difficulty. But he learned from this to use more discretion. He gave a considerable time to sacred studies, and became as well versed in the scriptures, and other sacred learning, as he was before in profane literature. His superior ordered him to make frequent exhortations to the religious, and as he had acquired a very great character for virtue and learning, Guy, abbot of Pomposia, begged his superior to send him to instruct his monastery, which consisted of a hundred monks. Peter stayed there two years, preaching with great fruit, and was then called back by his abbot, and sent to perform the same function in the numerous abbey of St. Vincent, near the mountain called Pietra Pertusa, or the Hollow Rock. His love for poverty made him abhor and be ashamed to put on a new habit, or any clothes which were not threadbare and most mean. His obedience was so perfect, that the least word of any superior, or signal given, according to the rule of the house, for the performance of any duty, made him run that moment to discharge, with the utmost exactness, whatever was enjoined. Being recalled home some time after, and commanded by his abbot, with the unanimous consent of the hermitage, to take upon him the government of the desert after his death, Peter's extreme reluctance only obliged his superior to make greater use of his authority till he acquiesced. Wherefore, at his decease, in 1041, Peter took upon him the direction of that holy family, which he governed with the greatest reputation for wisdom and sanctity. He also founded five other numerous hermitages; in which he placed priors under his inspection. His principal care was to cherish in his disciples the spirit of solitude, charity, and humility. Among them many became great lights of the church, as St. Ralph, bishop of Gubio, whose festival is kept on the 26th of June; St. Dominick, surnamed Loricatus, the 14th of October; St. John of Lodi, his successor in the priory of the Holy Cross, who was also bishop of Gubio, and wrote St. Peter's life; and many others. He was for twelve years much employed in the service of the church by many zealous bishops, and by four popes successively, namely: Gregory VI, Clement II, Leo IX, and Victor II. Their successor, Stephen IX, in 1057, prevailed with him to quit his desert, and made him cardinal bishop of Ostia. But such was his reluctance to the dignity, that nothing less than the pope's threatening him with excommunication, and his commands, in virtue of obedience, could induce Peter to submit. Stephen IX dying in 1058, Nicholas II was chosen pope, a man of deep penetration, of great virtue and learning, and very liberal in alms, as our saint testifies, who assisted him in obliging John, bishop of Veletri, an antipope, set up by the capitaneos or magistrates of Rome, to quit his usurped dignity. Upon complaints of simony in the church of Milan, Nicholas II sent Peter thither as his legate, who chastised the guilty. Nicholas II dying, after having sat two years and six months, Alexander was chosen pope, in 1062. Peter strenuously supported him against the emperor, who set up an antipope, Cadolaus, bishop of Parma, on whom the saint prevailed soon after to renounce his pretensions, in a council held at Rome; and engaged Henry IV, king of Germany, who was afterwards emperor, to acquiesce in what had been done, though that prince, who in his infancy had succeeded his pious father, Henry III, had sucked in very early the corrupt maxims of tyranny and irreligion. But virtue is amiable in the eyes of its very enemies, and often disarms them of their fury. St. Peter had, with great importunity, solicited Nicholas II for leave to resign his bishopric, and return to his solitude; but could not obtain it. His successor, Alexander II, out of affection for the holy man, was prevailed upon to allow it, in 1062, but not without great difficulty, and the reserve of a power to employ him in church matters of importance, as he might have occasion hereafter for his assistance. The saint from that time thought himself discharged, not only from the burden of his flock, but also from the quality of superior, with regard to the several monasteries, the general inspection of which he had formerly charged himself with, reducing himself to the condition of a simple monk. In this retirement he edified the church by his penance and compunction, and labored by his writings to enforce the observance of discipline and morality. His style is copious and vehement, and the strictness of his maxims appears in all his works, especially where he treats of the duties of clergymen and monks. He severely rebuked the bishop of Florence for playing a game at chess. That prelate acknowledged his amusement to be a faulty sloth in a man of his character, and received the saint's remonstrance with great mildness, and submitted to his injunction by way of penance, namely: to recite three times the psalter, to wash the feet of twelve poor men, and to give to each a piece of money. He shows those to be guilty of manifold simony, who serve princes or flatter them for the sake of obtaining ecclesiastical preferments. He wrote a treatise to the bishop of Besanzon, against the custom which the canons of that church had of saying the divine office sitting; though he allowed all to sit during the lessons. This saint recommended the use of disciplines whereby to subdue and punish the flesh, which was adopted as a compensation for long penitential fasts. Three thousand lashes, with the recital of thirty psalms, were a redemption of a canonical penance of one year's continuance. Sir Thomas More, St. Francis of Sales, and others, testify that such means of mortification are great helps to tame the flesh, and inure it to the labors of penance; also to remove a hardness of heart and spiritual dryness, and to soften the soul into compunction. But all danger of abuses, excess, and singularity, is to be shunned, and other ordinary bodily mortifications, as watching and fasting, are frequently more advisable. This saint wrote most severely on the obligations of religious men, particularly against their strolling abroad; for one of the most essential qualities of their state is solitude, or at least the spirit of retirement. He complained loudly of certain evasions, by which many palliated real infractions of their vow of poverty. He justly observed: “We can never restore what is decayed of primitive discipline; and if we, by negligence, suffer any diminution in what remains established, future ages will never be able to repair such breaches. Let us not draw upon ourselves so base a reproach; but let us faithfully transmit to posterity the examples of virtue which we have received from our forefathers.” The holy man was obliged to interrupt his solitude in obedience to the pope, who sent him in quality of his legate into France, in 1063, commanding the archbishops and others to receive him as himself. The holy man reconciled discords, settled the bounds of the jurisdiction of certain dioceses, and condemned and deposed in councils those who were convicted of simony. He, notwithstanding, tempered his severity with mildness and indulgence towards penitents, where charity and prudence required such a condescension. Henry IV, king of Germany, at eighteen years of age, began to show the symptoms of a heart abandoned to impiety, infamous debauchery, treachery, and cruelty. He married, in 1066, Bertha, daughter to Otho, marquis of Italy, but afterwards, in 1069, sought a divorce, by taking his oath that he had never been able to consummate his marriage. The archbishop of Mentz had the weakness to be gained over by his artifices to favor his desires, in which view he assembled a council at Mentz. Pope Alexander II forbade him ever to consent to so enormous an injustice, and pitched upon Peter Damian for his legate to preside in that synod, being sensible that a person of the most inflexible virtue, prudence, and constancy, was necessary for so important and difficult an affair, in which passion, power, and craft, made use of every engine in opposition to the cause of God. The venerable legate met the king and bishops at Frankfort, laid before them the orders and instructions of his holiness, and in his name conjured the king to pay a due respect to the law of God, the canons of the church, and his own reputation, and seriously reflect on the public scandal of so pernicious an example. The noblemen likewise all rose up and entreated his majesty never to stain his honor by so foul an action. The king, unable to resist so cogent an authority, dropped his project of a divorce; but remaining the same man in his heart, continued to hate the queen more than ever. Saint Peter hastened back to his desert of Font-Avellano. Whatever austerities he prescribed to others he was the first to practise himself, remitting nothing of them even in his old age. He lived shut up in his cell as in a prison, fasted every day, except festivals, and allowed himself no other subsistence than coarse bread, bran, herbs, and water, and this he never drank fresh, but what he had kept from the day before. He tortured his body with iron girdles and frequent disciplines, to render it more obedient to the spirit. He passed the three first days of every Lent and Advent without taking any kind of nourishment whatever; and often for forty days together lived only on raw herbs and fruits, or on pulse steeped in cold water, without touching so much as bread, or anything which had passed the fire. A mat spread on the floor was his bed. He used to make wooden spoons and such like useful mean things, to exercise himself at certain hours in manual labor. Henry, archbishop of Ravenna, having been excommunicated for grievous enormities, St. Peter was sent by Pope Alexander II in quality of legate, to adjust the affairs of the church. When he arrived at Ravenna, in 1072, he found the unfortunate prelate just dead; but brought the accomplices of his crimes to a sense of their guilt, and imposed on them a suitable penance. This was his last undertaking for the church, God being pleased soon after to call him to eternal rest, and to the crown of his labors. Old age and the fatigues of his journey did not make him lay aside his accustomed mortifications, by which he consummated his holocaust. In his return towards Rome, he was stopped by a fever in the monastery of our Lady without the gates of Faenza, and died there on the eighth day of his sickness, while the monks were reciting matins round about him. He passed from that employment which had been the delight of his heart on earth, to sing the same praises of God in eternal glory… being fourscore and three years old. He is honored as patron at Faenza and Font-Avellano, on the 23d of the same month. Also Read – February 23, 2018: The holy Lance & the Nails of our Lord (Fri. after the I Sun. of Lent).